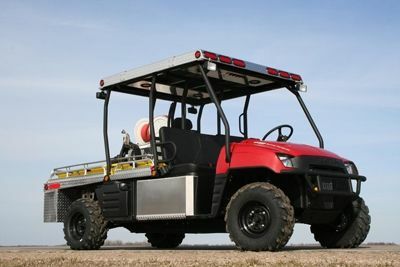 2009 Polaris Fire/Emergency Medical Rescue (O0855) :: Fenton Fire Equipment Inc.
100 gallon aluminum diamond plate water tank with interior baffles, large fill port, and outlet to the pump with gate valve. The water tank is mounted low in the chassis which lowers the center of gravity and allows for more bed space. 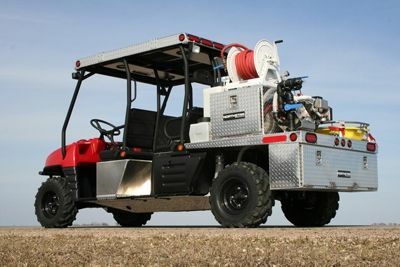 High Pressure self-priming pump powered by a 5 HP gasoline engine, foam injection system, and 50 feet of high pressure discharge hose with hose reel and a Scotty air aspirating nozzle with positive nozzle shut-off. 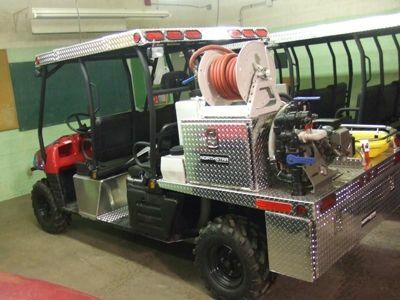 Foam induction valve adjustable from 0 to 6% and a 5 gallon tank with 5 gallons of FlameOut firefighting agent. 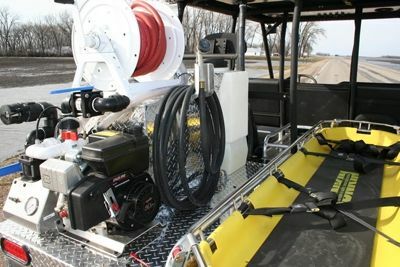 Auxiliary intake hookup for pumping from a stream or portable on-site tank and an additional pump discharge for hookup of lay-flat hose. Aluminum diamond plate rear deck. Matching aluminum diamond plate emergency cab top with LED flashing light bar, interior lights, and front and rear work lights. Overhead console with interior lighting and control panel. Attending medical technician seat beside the patient stretcher. Premium Junkin JSA 200 stretcher, ideal for unusually rugged rescue situations. 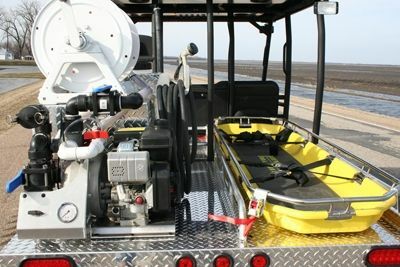 Quick detachable mounting, lockable storage compartments in rear and on deck for gear and supplies. Dimensions: Weighs approximately 2000 lbs.